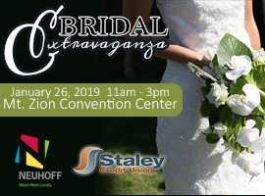 Come see vendors from Photographers, Catering, Venues to host your reception, Churches, DJ Services, Florists, Tuxedos, Rental Services, Hair & Make-up, and more ALL UNDER ONE ROOF! Be sure to Register to take advantage of special offers and prizes from our vendors. Plus! Talk with Staley Credit Union on ways to finance the wedding of your dreams.